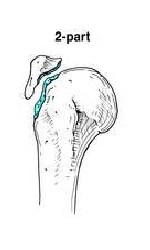 Humeral shaft is a Proximal Humerus Fracture is a common injury to the Shoulder, especially in elderly individuals due to osteoporosis. 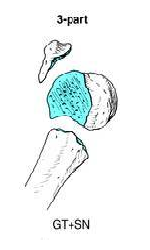 Proximal Humerus Fractures are among the most common broken bones in the Shoulder. 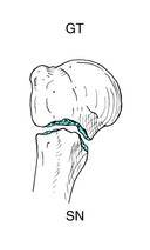 In fact, in patients older than 65, Proximal Humerus Fractures are the third most common broken bone (after hip fractures and wrist fractures). 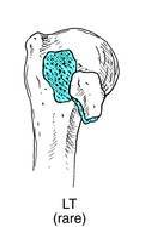 A Proximal Humerus Fracture occurs when the ball of the ball-and-socket Shoulder Joint is broken. 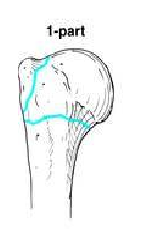 The fracture is actually at the top of the arm bone (the humerus). Most Proximal Humerus Fractures are non-displaced (not out of position), but about 15-20% of these fractures are displaced and these may require more invasive treatment. None of the parts are displaced (i.e < 1cm and < 45 degrees) These undisplaced / minimally displaced fractures account for approximately 70 - 80% of all Proximal Humeral Fractures and are almost always treated conservatively. 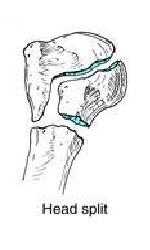 These fractures account for approximately 20% of Proximal Humeral Fractures. 1. 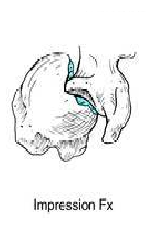 Greater tuberosity and shaft are displaced with respect to the lesser tuberosity and articular surface which remain together. Most common three part pattern. 2. 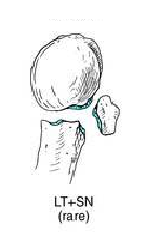 Lesser tuberosity and shaft are displaced with respect to the greater tuberosity and articular surface which remain together. 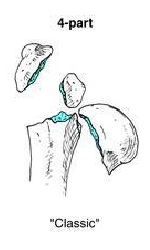 These fractures account for approximately 5% of proximal humeral fractures. These fractures are uncommon ( < 1% of Proximal Humeral Fractures). This pattern has poor non-operative results and as the articular surface is no longer attached to any parts of the Humerus which are attached to soft tissues, it has a high incidence of osteonecrosis. These fractures require operative management. About 80% of Proximal Humerus Fractures are non-displaced (not out of position) and these can almost always be treated in a sling. Typical treatment is to rest the shoulder in the sling for 2-3 weeks and then begin some gentle range-of-motion exercises. As healing progresses, more aggressive shoulder strengthening exercises can resume, and full healing typically takes about 3 months. The options for surgery include realigning the bone fragments and holding them in position with metal implants, or a Shoulder Replacement procedure is performed. If the fragments of bone can be fixed by either pins, screws, wires, large sutures or a plate will be used to hold the bones in place.